How to Landscape a flower Bed? Flower beds can be straight or curve gradually for a softer look. Flower beds give you the chance to bring color and texture to your landscape design. Use a flower bed to create a focal point, give purpose to an awkward space and reduce the amount of grass you must mow each week. A flower bed can take many shapes and can incorporate everything from small annual flowers to large heirloom shrubs. When you landscape your own flower bed, you should choose a design and features that complement the other landscaping characteristics in your outdoor space, and use plants that grow well in your area. Draft a scale drawing of your property on graph paper, including major features such as your house, sheds, patios, paths, ponds and existing flower beds. Use this drawing to gain perspective so you can determine the best placement and size for your new flower bed. Take a soil sample from the desired garden area. Use a home soil testing kit to test the soil's nitrogen, potassium and phosphorous, as well as its pH level. The test results will tell you whether you need to add fertilizer to the native soil, and whether to add iron sulfate to increase acidity or agricultural lime to increase alkalinity. Rather than amend the soil to adjust the pH level, you can simply choose to plant flowers that thrive in the existing soil conditions. Depending on your soil pH, try acid-loving azaleas (Rhododendron spp. ), grown in U.S. Department of Agriculture plant hardiness zones 4 through 9, or alkaline-loving delphiniums (Delphinium spp. ), which grow in USDA zones 3 through 8. Lay out the area for the flower bed, using flexible garden hoses; paint along the hose with landscaping spray paint. Cut into the ground along the painted lines with an edger or spade. Remove any existing turf within the garden area, and till the soil to a depth of 8 to 12 inches, using a rototiller or shovel. Add fertilizer, iron sulfate or lime, and fully incorporate the amendments into the soil. Add about 4 inches of organic matter, such as compost, manure, leaf mold, coarse sand and peat moss, to the existing soil to improve soil structure and drainage, particularly if you have heavy soil that drains poorly. If soil drainage is especially poor, you might opt for a raised flower bed. Build a raised flower bed or a berm that allows water to drain more quickly if soil drainage is especially poor. A berm is essentially a raised hill or mound shaped with imported topsoil; raised flower beds might be framed with wood or pavers. Arrange plants in the flower bed according to size so taller plants do not block the view of short plants. If the flower bed is in a corner or against a fence, plant taller flowers or shrubs at the back of the bed, and then plant medium-sized flowers in the middle and shorter flowers at the front. 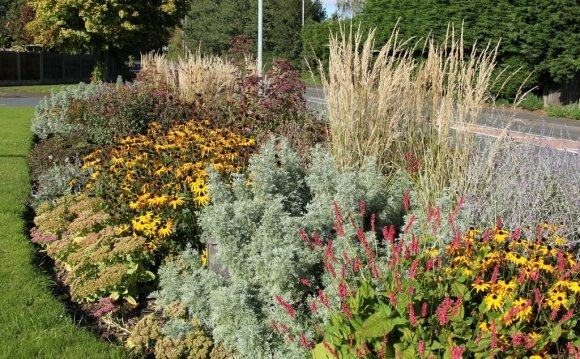 In an island flower bed that can be seen from all sides, place tall plants in the center and reduce the height of plants as you reach the edges of the bed. Plant some shrubs in the flower bed so the bed has some interest in winter when other plants die or go dormant, if desired. Leave large flower clusters such as hydrangeas (Hydrangea spp. ), grown in USDA zones 3 through 9, on the plant to add some texture to your winter flower bed. Other shrubs add color through winter, including any number of evergreen shrubs. Winterberry holly (Ilex verticillata), grown in USDA zones 3 through 9, is adorned with bright red berries throughout winter. Arrange plants in straight rows for a more formal, structured look, staggering the plants in each row with the previous row so that all plants can be seen. Alternatively, plant flowers en masse for a more relaxed appearance; odd numbers of plants, such as groups of three or five, look best in mass plantings.